Now if it was my four year old Simeon saying ‘no, my turrrrn’ and my two year old Ariella saying, ‘I can’t do it I neeeeed help’ that would be fine. But that is not what is happening. Ariella has suddenly developed an independence streak that extends to everything from putting on her own shoes to buckling herself into her booster seat including putting on her own tray. It is cute, but often not very helpful. A lot of the time she doesn’t have the dexterity to do the thing she wants to do. However when I step in and try to help out she often gets mad and yells, ‘no, my turrrrn’. Simeon on the other hand has suddenly developed a feigned incompetence that extends to everything from putting both of his arms into his jacket to buckling his seatbelt. I wish I could call this behaviour cute, but it is far from it. It seems to strike whenever I am attempting to get us moving quickly. Often as I try to get myself and Ariella ready to head out the door Simeon walks over to me with one arm in in jacket, hood on his head and says, ‘I can’t do it I neeeeed help’. The worst part of it is I have seen him put on his jacket, or do almost everything he has decided he can’t do, many times before. But suddenly without warning this job has become a task far too complex for him to handle. There are days when their behaviour drives me to my wits end. Their behaviour make me frustrated, and annoyed.I have even been known to raise my voice. I just want my kids to listen; to either let me help, or do what I ask. When I step back and really look at my kids behaviour I see myself staring back. When I reflect on my life I can’t help but wonder, just how many times have I dug my heels in and told God that I wanted to do things my way and not his way. How many times have I looked at him and said ‘no my turrrrn’? Likewise how many times over the course of my life has God asked me to do something only for me to say no. I would say that I wasn’t called to do it, or qualified to do it, that it really was someone elses job. I may have come up with lots of adult reasons why I wasn’t going to listen but in my heart of hearts what I was really doing was saying ‘I can’t do it I neeeeed help’. Right now we are trying to teach Ariella that sometimes it is ok for others to help you. At the same time we are trying to teach Simeon that sometimes you have to do things even if they seem hard. The strange thing is, it seems like God is teaching me those same lessons through my kids. 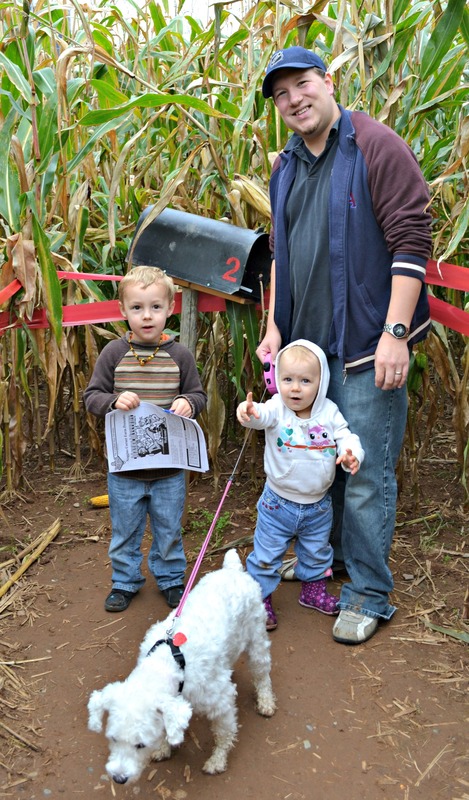 Last Fall Making Our Way Through A Corn Maze. Ariella is well she is Ariella…what can I say ? He may be having just that.I almost hope that is what it is. At least then I would have a reason for his odd behaviour of late.